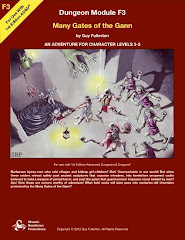 Chaotic Henchmen Productions: Publishing #6: What is Good Layout? Good layouts combine good visual design with good arrangement of the content. The previous article (Visual Design Tidbits) is as much as I feel comfortable saying about the design aspect of good layout. This article covers the second aspect of good layout: Ideal physical arrangement of the content. That is, how you should and – more importantly – shouldn't chop up related bits of text, illustrations, and other content in order to fit the product onto pages. 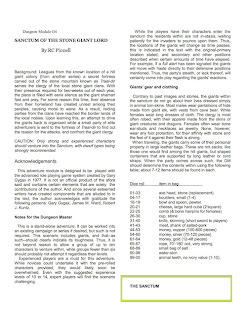 Labyrinth Lord's charm monster spell description requires a page flip. In and of itself, having to flip pages to read the entirety of a spell description isn't horrible, though it's certainly not ideal. This particular example is notably problematic because the spell header itself (spell name, level, duration, range) is split across two pages. In general, avoid breaking a spell description across a flipped page. But if you absolutely must do it, keep the spell header all together on one page, plus at least a few lines of the rest of the description. These are special cases of unfortunate page flips, with more troublesome consequences. 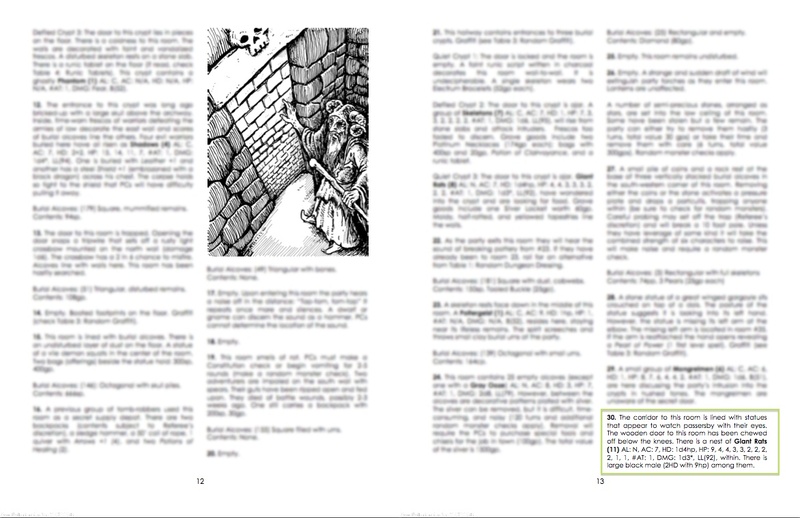 Here's an example from Barrowmaze, showing the 2-page spread for pages 12-13 as it would be in the physical book. The description for area 30 (in the green box) looks complete, with a description of the area & occupants that clearly terminates the paragraph. You can run area 30 with all that's shown here. 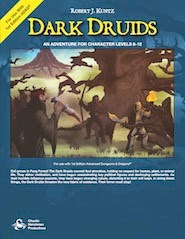 And in fact, when I ran that area (my AD&D group is currently exploring Barrowmaze), that's exactly what I used. No more, no less. ... but there's more to area 30, practically hidden on page 14. The description for area 30 continues onto the next spread, and I didn't discover it until too late. In the grand scheme of things, the unused content is no big deal; the hard-to-notice details for area 30 aren't critical for enjoying the module. But the problem isn't this room description. The problem is lack of predictability. One or two unfortunate cases don't just impact play for those areas; they train the reader to expect problems, thus forcing time-wasting double-checks on all the other cases that are actually just fine. In general, avoid breaking room descriptions across two different spreads. But if you must do so, at least break the description so the reader can clearly see that a page flip is necessary. In this particular case, a "(cont'd...)" notice at the very bottom would have been useful. As much as possible, creature stats ought to be kept together with their room description. Hopefully you're sensing the trend. But this example teaches a more important lesson: PDFs sometimes have stricter standards regarding breaking elements across multiple pages! Unlike the two earlier examples, this example doesn't show a two-page spread. That's because two-page spreads (and the resulting less-strict layout demands) are only applicable for documents printed in book / booklet format. 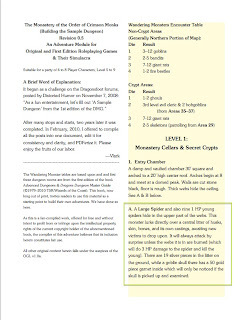 As a free PDF with no print-on-demand option, if this particular Dragonsfoot module gets printed, it's most likely going to be a set of single-sided individual pages. So every page is its own spread (a one-page spread) and represents a potential for an unfortunate flip situation. "Rockfist Rockheart" – stats ascendant, but head alone on the ground. 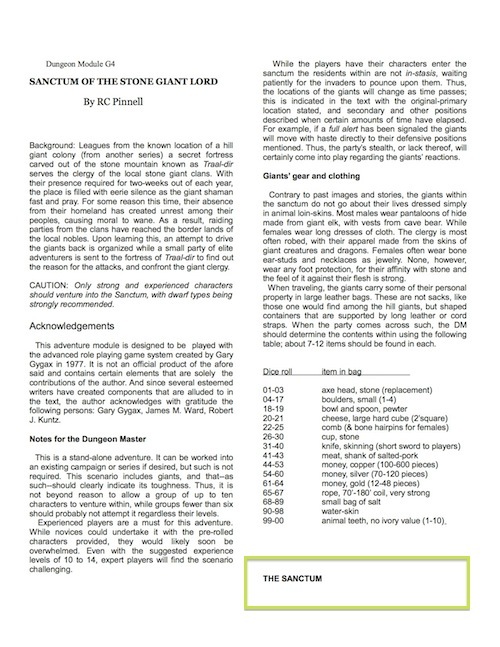 In both of these cases, the section header is the last line in a column, and the rest of the description starts at the top of the next column. It's ugly, jarring, and easy to avoid. Don't do it. For these purposes, section headers can be many things: Room/area names, NPC names, subsection titles, table names, and so on. In all cases, these should be in the same column as the first part of their corresponding descriptive text. The blank line makes the column tops look uneven. Blank lines like these cause the page to look uneven, but more importantly they use up vertical space that might be preferable to use for additional content at the bottom of the column. This problem typically happens when the layout uses actual empty lines (i.e., presses of the return key) to add whitespace between paragraphs. Instead of using empty lines, use paragraph spacing. Most word processors and layout programs allow you to specify a gap (usually in points) that should come before and/or after paragraphs; the software wisely chooses not to apply that gap to paragraphs that start at the top of columns. 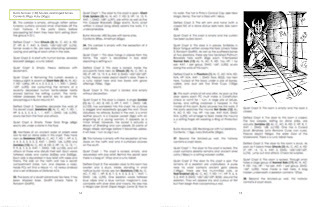 The Dungeons & Dragons Basic and Expert rulebooks from 1981 (the Moldvay and Cook/Marsh edits) won't win any awards for flashy visual design, but they are exemplary models of good layout arrangement for gaming content. 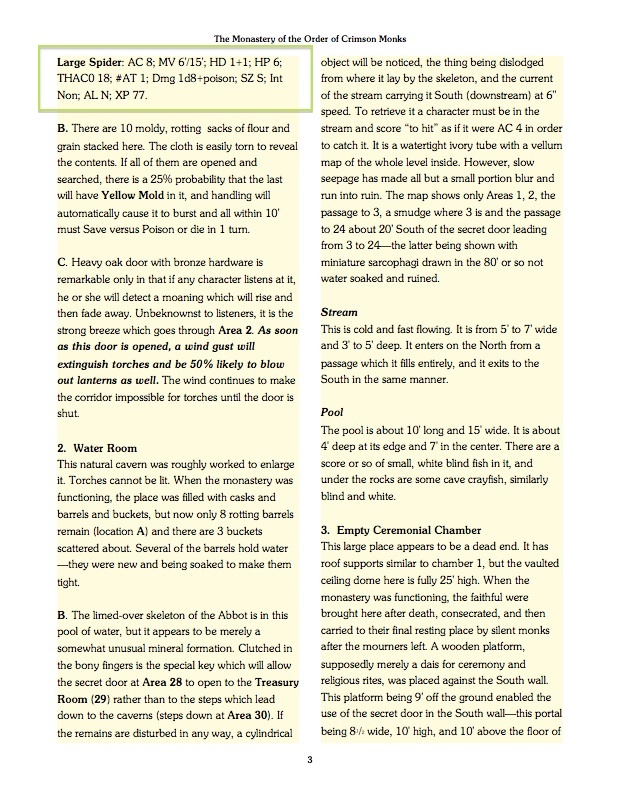 Both rulebooks do a great job avoiding unfortunate breaks across columns, pages, and spreads. They're not 100% perfect, but layout perfection is hard to achieve, and their few arrangement flaws are generally pretty minor. 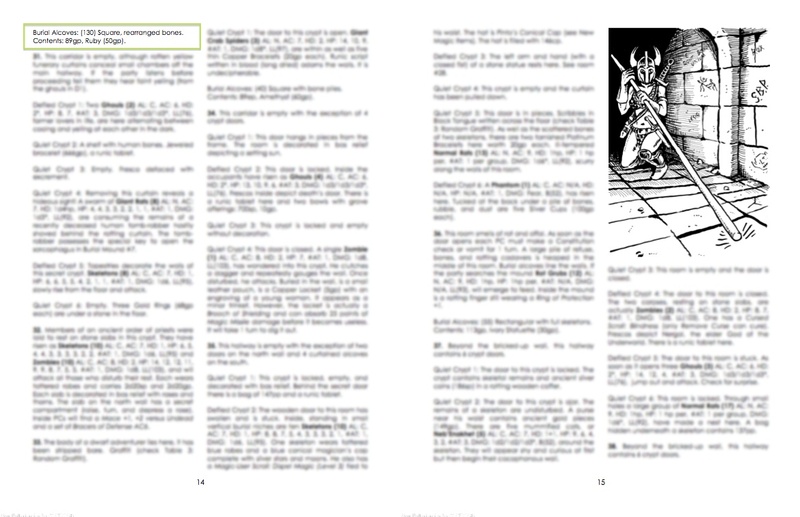 The following series of pages from the Basic rulebook contains absolutely nothing that breaks across page boundaries. Every section and/or subsection fits precisely onto the relevant page/column. In this first Basic spread, the top text spans both columns on each page, which allows the rest of the text to fit precisely into natural and equal column lengths, without breaking a paragraph across those columns. 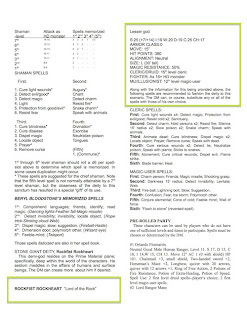 Also note how the indentation within part of the cleric class description precisely enables that column to be exactly the same physical height as the dwarves/elves column. Someone intentionally chose the specific amount of indentation in order to equalize the column heights. 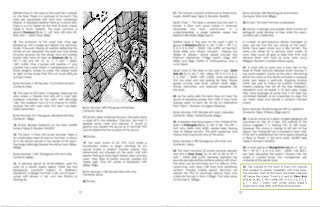 In this second Basic spread, the precisely-chosen illustration heights allow each page's worth of text to exactly fill the page without breaking a paragraph across two columns. On the left page (p. 10), someone added a little bit of extra whitespace above "Magic-Users" and "Thieves" so that the bottom of that column rested flush with the bottom of the illustration. The third Basic spread's weapon illustration allows for perfectly even column bottoms. On the right page, the box around, and the particular indentation amounts with the Example allow it to exactly fill the rest of the page. It's also likely that the Example wording itself was tweaked in order to fit precisely. 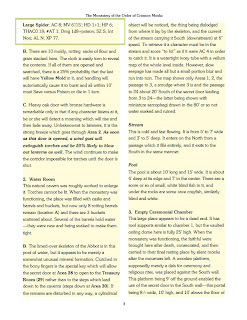 And now, take a look at a series of equally-impressive spreads from the Expert rulebook. This first Expert spread shows how it avoids breaking spell descriptions across pages. Note how the two illustrations fill exactly the right amount of space to allow optimum fit. There are no page-broken spells at all within the eight-page spell chapter. This second Expert spread shows the last page from the spells chapter. Note how the precise illustration size allows the spells chapter to end on an even page boundary, which in turn allows chapter 4 to begin at the top of a fresh page. This final Expert spread comes from the monsters chapter. Although the monsters chapter has a few spots of rough layout arrangement, this particular spread is pretty great. 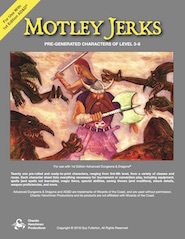 No monster descriptions are broken across pages, only one monster is broken across columns, and the quantity and sizes of the illustrations allow all the column tops & bottoms to align nicely. 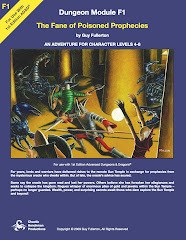 Some people believe these Basic / Expert rulebooks are the most elegant rulebooks produced by TSR. Its fans rave about the elegance of the rules, the clear verbiage and the good organization – all three attributes are built upon the foundation of a good layout arrangement! Know your spread size. For books / booklets, spreads span two pages, with an even-numbered page on the left and an odd-numbered page on the right. (The first page of the book stands alone, as does the last page if it's even-numbered.) For PDFs where you expect the reader to print them at home as individual single-sided pages, spreads are really just single pages. Start major sections on even boundaries, generally at the top of a page or column. Keep tops and bottoms of columns flush. Use artwork, spacing adjustments and other tweaks to keep the layout visibly even. This will be covered in more detail in another article. Don't split critical information across multiple columns, pages, or spreads. This includes stat blocks and spell headers. Avoid Widows, Orphans, and Beheaded Headers. 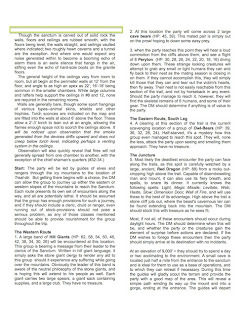 Keep section headers (including room names and spell names) in the same column as at least several lines of the corresponding description. More generally, try not to leave one line of a longer paragraph all by itself at the top or bottom of a column. Wikipedia has more info. Keep each item entirely within a single column. 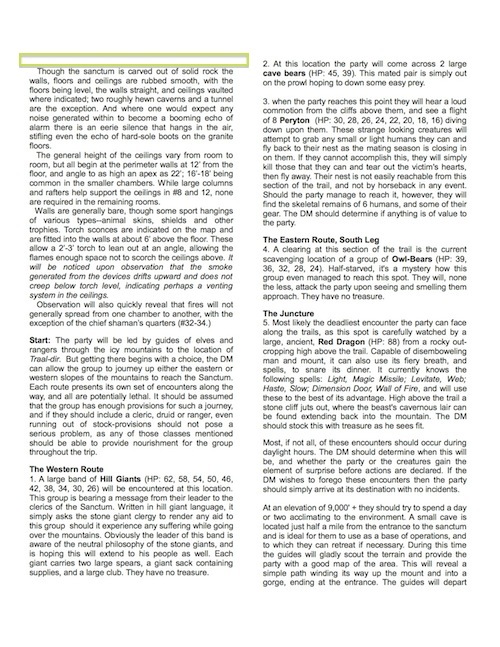 Try to fit the entirety of room/area descriptions on one column, including any associated monster stats. 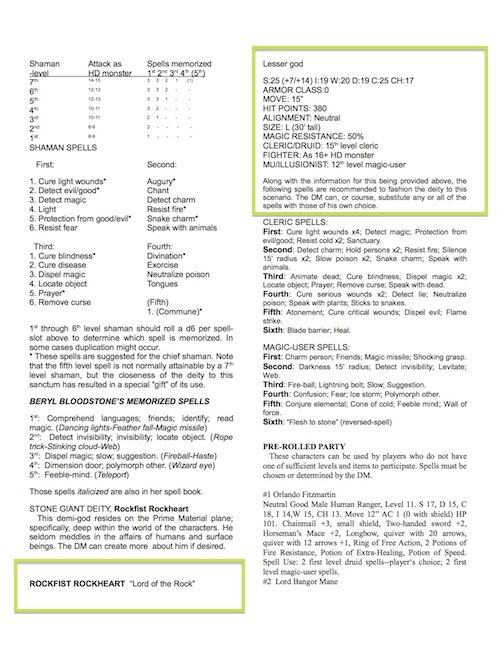 Ditto for spell descriptions, magic item descriptions, monster write-ups, NPC capsules, class descriptions, and similar. This won't always be possible (sometimes the text for an item is just too long), so do your best to keep each item entirely on a single page. Keep related items on the same spread. For example, when two rooms are strongly associated, and likely to be referenced in play at the same time (perhaps because the occupants respond as help for one another), make sure they are visible at the same glance, generally by keeping them on the same page or spread. Avoid breaking tables across columns whenever possible, and especially across pages and spreads. In a nutshell, some elements should never be split across multiple columns. For other elements, it's okay to split them across multiple columns, as long as you don't split them across multiple pages. And for longer elements, splitting across pages is okay, but try not to split them across spreads unless they're very long. This all comes back to the earlier articles' points about making choices that allow you to fit a great deal of content on each page: Appropriate language brevity, font size, margins, etc. The more content a page can potentially hold, the more content a column can hold, and thus the less likely any given element will need to break across a column, page, or spread in a jarring way. Good tips on this. As the person who put the Monastary of the Crimson Monks together, I'd like to point out that the file is still a draft (it's version .05, afterall). There are some typos I need to correct and the layout font and spacing are too large--this was done on purpose at the time to put it in the hands of the community for feedback. I expect to update the file soon (I've been saying this for about six months, so I guess I should actually do it). 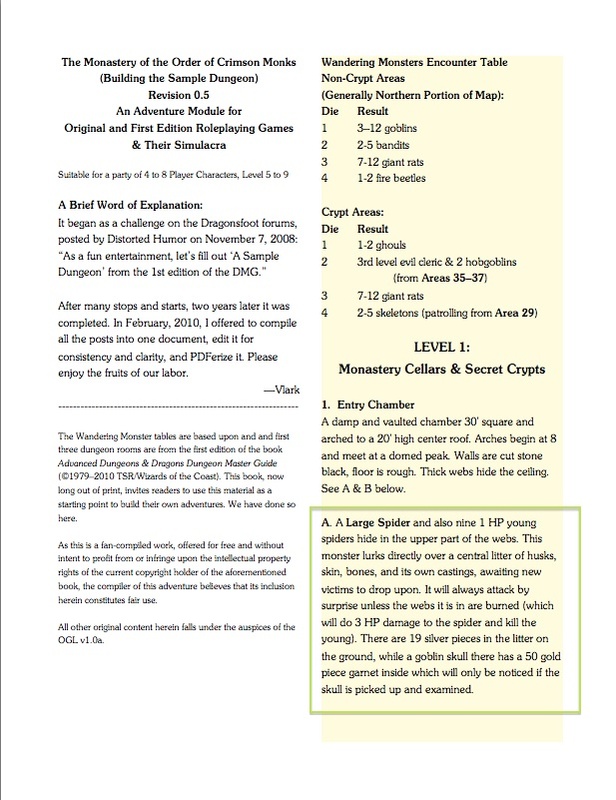 However, if you view the PDF in two-up mode (assuming you have a large enough screen), the descrpition and the stats appear on the same screen. I often work in two-up mode when working with files, so this entry serves as an extra caution to look at files in single-page mode, too, to make sure things look OK for regular users. Thanks for pointing out that issue on LL page 27-28; it's easily fixed and just slipped by me. Please be more careful with your language use. Ack! You're right; "insidious" feels too ... actively malicious. Ironically, I did take extra care with that word. I was okay with it at the time because my computer's dictionary has a non-judgemental primary definition: "proceeding in a gradual, subtle way, but with harmful effects." But I can see from other dictionaries that a judgemental reading is probably more common. I'll change it to something else. Thanks for helping make the article better!